THE great Francis Bourke was but 72 days from his fifth premiership as a Richmond player when the legendary former Carlton footballer Harry ‘Soapy’ Vallence ambled through the bar room doors of the salubrious Epping Hotel. It was July 1980, and Bourke was committed to the pub as a partner with Bill Drake and the late Graeme Richmond. South Melbourne’s 1955 Brownlow Medallist Fred Goldsmith was also working the bar at the time, and he and Vallence were old mates. As Francis recalled this week: “‘Soapy’ came out to visit Freddy and me at the Epping Hotel where we were ensconced and while I don’t know where he lived I remember him complaining about ‘how bloody far it was’”. On the day in question, ‘Soapy’ appeared with a mounted print of a photograph, presumably captured in the late 1930s, of himself in dark navy strip moments after he’d launched a barrel on what appears to be the mighty MCG. The mounted image carries the inscription in ink: Best Wishes Francis, Harry “Soapy” Vallence, 17-7-80. Francis was of belief that the signed photograph in question “was originally taken during some sort of demonstration or exhibition on the MCG”. As he observed: “the photo shows Harry kicking the ball wearing white shorts while his teammate, also wearing the Carlton guernsey and standing there watching, is wearing dark shorts”. Francis’ theory was proved correct through a subsequent Trove search, in which the relevant image was located in an edition of The Sporting Globe, dated Wednesday, November 10, 1937. Harry Vallence kicking 69 yards at the Melbourne Cricket Ground to win the international kicking test against Stanford University. Slightly in front of Vallence is Eric Huxtable, who won the drop kick section, and behind Vallence is Frank Gill. The Sporting Globe, November 10, 1937. The Globe reported that Carlton defeated the American University in the international kicking contest arranged by The Sporting Globe’s American correspondent H. Archie Richardson, a former Victoria. “An Australian Rules ball and an American ball was used by both teams,” reported the unnamed correspondent. While Francis’ memory of that meeting with Vallence at the Epping Hotel is clear, so too are his memories of previous encounters with the Carlton’s 204-game premiership player and eight-time leading goalkicker. As Francis said: “‘Soapy’ was also a Life Member of the VFL so I used to come across him at the various functions from time to time. I had a really lovely relationship with him and Freddy worshipped the ground Harry walked on. He was a really personable fellow”. 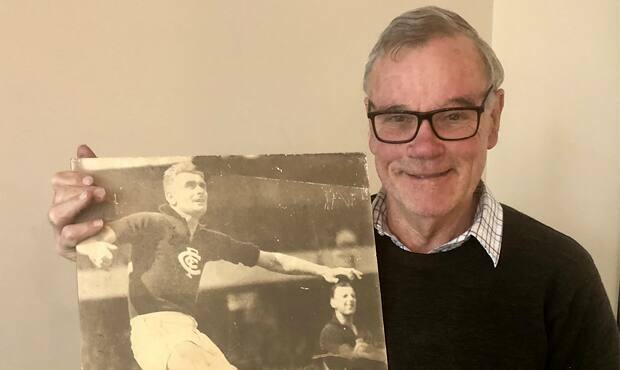 While Francis contended with a wry smile that ‘Soapy’ “of course he played for the wrong team”, he hoped that the famed image of more than 80 years ago might elicit a new interest and appreciation amongst supporters frequenting the old Carlton ground.